I come from a poor family and I want the poor to get dignity. We want to start a movement for a clean India. If we have to build a nation, let us start from the villages. India used to be known as the land of snake charmers. Today, our IT professionals have left the world spellbound. There is no full stop in politics. For every policy they have a precedent. My grandmother did this, my father did that and my great-grandfather did something else. Is this how you run a country? I want to ask parents, when daughters turn 11 or 14, they keep a tab on their movements. Have these parents ever asked their sons where they have been going, who they have been meeting? Rapists are somebody’s sons as well! Parents must take the responsibility to ensure that their sons don’t go the wrong direction. Can someone tell me, whatever we are doing, have we asked ourselves if our work has helped the poor or come to benefit the nation in any way? We should come out of the ‘Why should I care’ attitude and dedicate ourselves to the nation’s progress. ‘I did not get an opportunity to die for the country, but I have got an opportunity to live for the country’. Kay kbhi ham apne desh ki liye Kam aaye ge . Ham bhi desh ki liye kuchh karna chah te h. Par kuchh karne ki liye spot ki jarurt h.
bhrat mata ki jay . har har modi , ghar ghar modi . 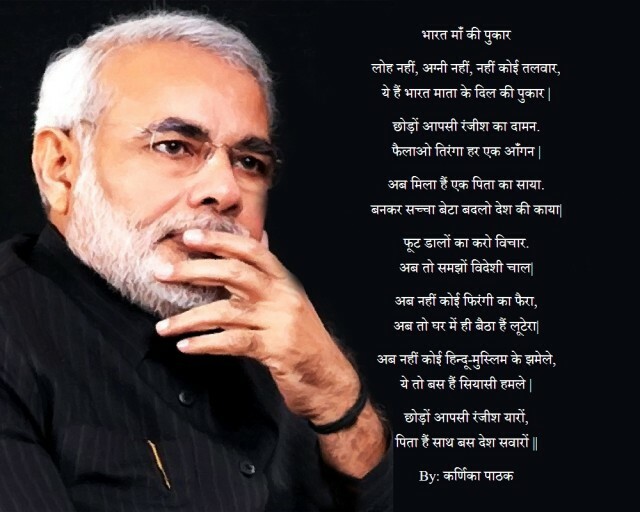 modiji ham aapme vivekanand dekh rahe hai . aap vicharshil hai . aap par pur bharosh hai . desh ko sone ki chidiya banake rakhoge . modiji aap kisaan ke bare me jaroor kuch kariyga .